If I told you that actress and suspected human tree Shailene Woodley is a supporter of presidential hopeful Bernie Sanders, how shocked would you be on a scale of “not shocked” to “nope, still definitely not shocked”? Well then. On May 22, former Ohio state senator Nina Turner posted an online flyer on Twitter advertising a “Rock the Campus” event for Sanders supporters, which is scheduled to take place on Monday. According to the flyer, the event will include a panel discussion featuring Turner, Woodley, Hawaii congresswoman Tulsi Gabbard, and actress Rosario Dawson as guest speakers. Seriously though, are you more surprised than when you found out something you were expecting to happen actually happened, y or n.
Despite the fact that you were probably not wondering about this at all but inevitably conceded to the fact that it must be stated, Woodley has been an outspoken advocate for Sanders for awhile now. 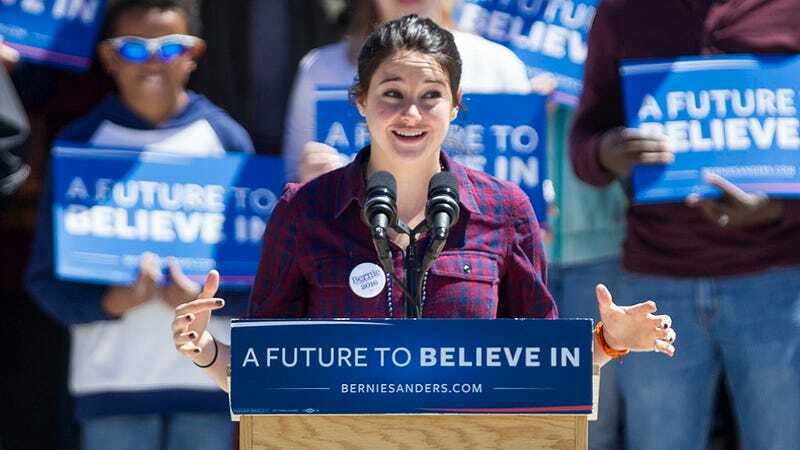 Back in March, Uproxx reported that the Divergent trilogy star/chronic hugger has tweeted about feeling the Bern approximately three times within the past five years, and has spoken at a number of rallies in support of the Vermont senator’s presidential bid. In the interview, Woodley also explained her reasoning behind backing Sanders as the Democrat presidential nominee, as well as why she chose to declare it publicly on Twitter, despite the risk of alienating members of her fan base. It was definitely a calculated decision. I didn’t just impulsively decide to send out that message [on Twitter]. I believe in him, man! I believe in Bernie Sanders! I think he would make a really wicked president. And he’d change this country for the good and propose some progressive standards upon the way we’re modernly looking at the world and about climate change, and equality, and rights amongst women, and the LBGTQ community. I hope to use that platform to encourage young people to go vote. Because regardless of what happens and who wins, we are so lucky for having the opportunity to vote, being American. And I think it’s important we remember that and take advantage of that. ...of course, [I] hope people will go see [my] movies regardless of what my personal political views are. And at the same time, I’ve got a million people on Twitter, so I figured I’d use that platform for something I believe in. Twitter is a means to speak your truth, right? That was my truth. So there you have it: news!